Head for the salad, soup, veggie, and Asian bars, where you can customize your meal, or to the vegetarian frozen section. Local, fresh, and tasty: three words that describe Greenstar. Here, you can get your favorite nuts, seeds, beans, fruit, and trail mix to munch on in between classes. Grab lunch with their many selections of soups, pastas, and sandwiches prepared fresh daily. The folks at Greenstar believe in buying from companies that use sustainable manufacturing practices, and they get their food from tons of local suppliers, which means you’ll feel safe about what you’re eating. Tired of resorting to salad, pizza, or veggie burgers? You won’t find that problem in Ithaca. 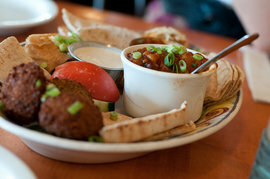 Here’s a taste of just some of the vegetarian-friendly options the city has to offer. College students find themselves ordering food to their dorm at all hours of the day and night, and there are many places vegetarians and even vegans can turn to when in need of a quick delivery. It’s the best delivery place when everyone in your group wants something different. Sink your teeth into a burrito packed with beans, cheese, and veggies; an avocado wrap; or a roasted red pepper salad if you’re looking for something more substantial. Best perk: It’s just minutes from campus, so you won’t wait long for the food to arrive. At some point, almost every IC student orders from “The Pizza Alternative.” They offer every type of calzone imaginable, and non-meat eaters can choose from one of seven vegetable ’zones or create their own. Ithaca is packed with Asian places that deliver vegetarian favorites, like fried tofu sushi and edamame from Plum Tree Japanese Restaurant or vegetable lo mein from Capital Corner. Two restaurants in town are almost exclusively vegetarian or vegan. Moosewood is nationally renowned for its natural food cuisine. The menu changes daily, so you can be sure the food is fresh. While this may not be the place for a casual night out with friends (it’s a bit pricey! ), it’s the perfect place to show parents when they visit for a weekend and want to take you and your roommate out to dinner. Ithaca’s only vegan restaurant offers raw, gluten-free choices without sacrificing taste. Enjoy a burrito made with soy milk, vegetables, guacamole, nuts, and corn. Or grab a quick strawberry smoothie and a brownie made without animal products. Every dish is a work of art -- you’ll feel like you’re digging into a Food Network creation. Ethnic restaurants are always a good choice for vegetarians. Some Ithaca favorites include Café Pacific, The Pita Pit, Aladdin’s, and Sangam in Collegetown, as well as Taste of Thai in the west end. Here are some of our faves around the Commons. If you’ve ever wanted to eat a meal in a tree house, you’ll get the same feeling inside Maté Factor, where venturing inside is like stumbling upon a forest. Do some homework as you sip some organic yerba maté tea or something from the juice bar, or try a wrap with feta and olives, hummus, or tofu and avocado. If you want food and sports, both vegetarians and meat eaters can come here to eat and watch ESPN on one of many TVs (including two 61-inch screens) in harmony. Share some jalapeno poppers or try the macaroni and cheese in a bread bowl, the veggie quesadilla, or the sandwich with guacamole and black bean spread. Vegetarians will love this Mexicanrestaurant, where the inexpensive food is made with fresh ingredients. Tacos and burritos come with two choices of veggie filling, either fresh, juicy tofu or Calabacitas (a mix of zucchini, corn, lima beans, and onions). The tofu quesadilla made with carrots and slaw is excellent for a non-Mexican taste. Or stay traditional with veggies, cheese, and beans. The decor is fun and bright, perfect for a casual meal with friends. Get your classic veggie burger here, or more gourmet options such as pine-nut-encrusted fried mozzarella, butternut squash ravioli, and risotto cake with mushrooms. The menu has 14 different items that could be served gluten free, and the cooks are very good at accommodating special dietary needs. Whether you’re looking for a morning bagel, a sandwich for lunch or some coffee and a sweet treat in the afternoon, Collegetown Bagels has it all, and they’re very friendly to vegetarians! With CTB’s almost limitless options, you can have a different bagel sandwich every day of the week. Though it’s not on the Commons, Aladdin’s is such an IC fave, it can’t be ignored. At this Greek and Mediterranean spot in Collegetown, you’ll find tons of vegetarian delights: hummus, tabouleh, falafel, tzatziki dip, vegetarian chili, baba ghanouj pita, spanakopita, and vegetarian lasagna. Fun fact: 6 to 7 percent of Ithaca College students maintain a vegetarian or vegan lifestyle, while 2.3 percent of the entire U.S. population does. So don’t worry, the College’s dining service has taken notice, and you can find vegetarian- and vegan-friendly options at all of the dining halls. The Campus Center Dining Hall has its own vegan section; the Terrace Dining Hall has a great deli section where you can get a hummus, guacamole, and roasted vegetable wrap. Taco Tuesday is a fun theme at Towers Late Night, where you can sit alongside your beef-eating friends and munch on a veggie refried bean taco or some cheese nachos. Whichever dining hall you choose, you’ll always have more to pick from than just salad and pizza. Get the scoop at ithacadiningservices.com.